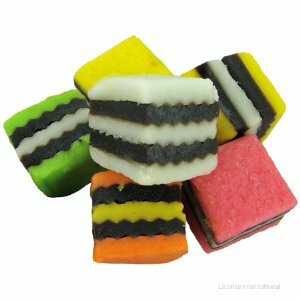 Darrell Lea Licorice Allsorts are a colorful combination of sweet sandwiches layered with fruity confection and licorice. Chunky pieces make this a tasty dessert option. Cane sugar, glucose syrup (wheat, corn), wheat flour, molasses, water, vegetable oils (palm kernel oil, coconut oil), invert sugar syrup, desiccated coconut, corn starch (wheat, corn), salt, glycerin, licorice extract, aniseed oil, gelatin, treacle, rice bran oil, artificial flavors (vanillin, coconut), colors (FD&C yellow #5 and 6, FD&C red #40, FD&C blue #1). May contain traces of milk and soy.